The team from Wales College of Medicine at Cardiff University say this could provide a more ethically acceptable way of creating 'embryonic' stem cells. The 'embryos' do not contain any paternal chromosomes, so could not develop into a baby. 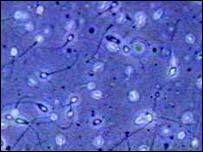 The process, described in New Scientist, uses an enzyme found in sperm to prompt the egg to divide. The researchers say the enzyme could also be used to help couples unable to have children because the man's sperm has too little of this key protein - called PLC-zeta. PLC-zeta, phospholipase C-zeta, is produced by sperm, and plays a key role in activating the egg, allowing it to be fertilised. The researchers called the enzyme "the spark of life". The study, also published in the journal Reproduction, showed human eggs treated with PLC-zeta continued to divide for four to five days. This is the blastocyst stage. In embryos which have developed through fertilisation, this is the stage at which stem cells can be extracted. The researchers say this should also be possible using the process they have developed. They are one of a number of teams working to develop new ways of creating blastocysts to provide stem cells. The Cardiff team, led by Professor Karl Swann, found the embryos appeared to undergo the same changes as naturally fertilised eggs, suggesting they will also be able to produce stem cells. Nazar Amso, a senior lecturer in the Department of Obstetrics and Gynaecology at the University of Wales College of Medicine, said: "There are a number of potential benefits, including the possibility of generating embryonic stem cells without the need to use embryos that were originally created for a couple's IVF treatment." He said it could also help couples affected by severe male factor infertility for who conventional IVF procedures do not work. "This could be because the sperm is deficient in the PLC-zeta which activates the egg. "It may be that we could use this enzyme as a therapy for couples whose only option currently is to use donor sperm." He added: "It is very early days. But this is the beginning of very promising avenues of research." Fertility expert Simon Fishel, said it was possible to trigger egg division using chemicals, or simply by pricking it. But he added: "The fact that they have found a biological trigger to prompt the egg to divide is fabulous. "I salute them for their ability to isolate this enzyme." Dr Fishel added; "It provides exciting possibilities for the future of stem cell research." But he said more research would have to be carried out to ensure such stem cells could be widely used, and would not trigger an attack from the recipient's immune system." And he said isolating the enzyme may help relatively few infertile couples. "You would have to assume the couple had an infertility problem to do with the sperm lacking this substance." He added that any eggs treated this way would also have to be closely monitored to ensure they were fertilised, and developed, properly. Josephine Quintavalle of the group Comment on Reproductive Ethics, expressed concern over the Cardiff team's research. She said: "I'd be happier if it was beyond all reasonable doubt that [these embryos] could not become a human life." Ms Quintavalle added that women should not be exploited to provide eggs.